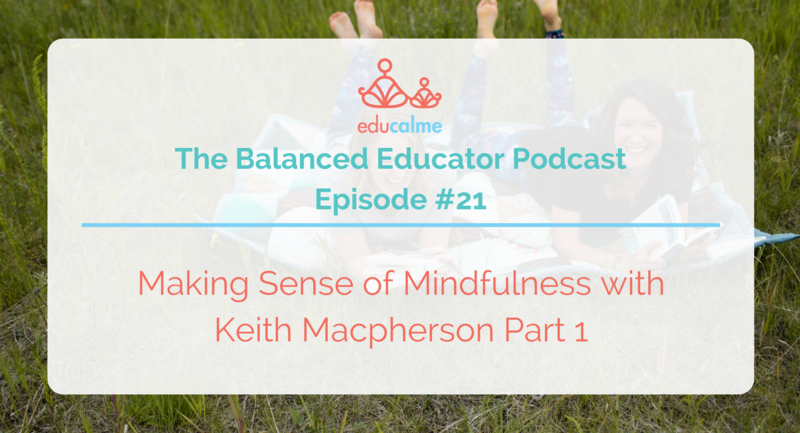 In this episode of The Balanced Educator Podcast, we’re interviewing Keith Macpherson. Keith is a mindfulness trainer, life coach and author of the new book, Making Sense of Mindfulness. Through his work in the field of mindfulness, Keith has created a five principal framework to assist the masses in comprehending the buzzword “mindfulness” and integrate this practice into their daily lives. Aside from his work in mindfulness, Keith is also known as a professional musician, most notably being a top finalist on the hit television series, Canadian Idol. As a professional speaker, presenter and musician, Keith has spent over twenty years touring globally in countries including Canada, The United States, Mexico, Africa, Dubai and The United Kingdom. He is currently a regular columnist in The Balance Magazine and inspires thousands of people around the world with his daily intentions on social media. We discuss how mindfulness isn’t just a seated practice, it is a way of being in the world. Keith explains how our mind and body are in a relationship and he talks about the importance of listening to our bodies and our gut instincts. Keith explains how all our power is in the present moment and how to harness our power. Keith shares a great idea for what to do when we are feeling stuck during the creative process and we discuss how to bring this into the classroom. Keith talks about how to teach from a place of intuition rather than being too stuck in just teaching the curriculum. Keith shares how and why he wrote his new book Making Sense of Mindfulness. You can connect with Keith and order his book at https://www.keithmacpherson.ca/. We’re hosting a yoga and mindfulness experience from March 23 to 30, 2018 called Spring Break Teachers: Unplug, Unwind, Recharge in Riviera Maya, Mexico! If you would like more information you can check it out at Solstice Travel’s website here.